Speaker Nancy Pelosi has issued a new statement (and explanation) after released documents appeared to contradict her earlier denials that she had ever been briefed on the use of torture. As discussed in a prior blog, Pelosi previously insisted that she was never told that these “enhanced techniques” (aka torture) were being used and assumed that the briefing concerned just a hypothetical use of the methods. Now, she is changing her story to acknowledge that she, at a minimum, knew that the methods would be used — even though she is denying that she was actually told that they had been used. I discussed the story on this segment of Rachel Maddow’s show. Second, it hardly amounts to a morally superior position to say that I was told that they were going to torture people, not that they had already tortured people. Describing war crimes in the future tense has never been a viable defense. It is like saying that the White House was describing a murder in the future tense, so I really did not see why I had to act to stop it. (on camera): September 2002, you were briefed on CIA detention issues and enhanced interrogation issues. Because of those briefings, and I know you that you expressed concerns to the NSA after that October 2001 briefing, you released that publicly in 2006. You didn`t express public concerns at the time after those briefings. Does that raise a complication? 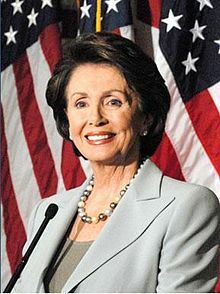 REP. NANCY PELOSI (D-CA), SPEAKER OF THE HOUSE OF REPRESENTATIVES: No, no. The fact is they did not brief – first of all, we`re not allowed to talk about what happens, but I can say this. They did not brief us that these enhanced interrogations were taking place. They did not brief us that was – they were talking about an array of interrogations that they might have at their disposal. MADDOW: Techniques in the abstract, as if they were not being used? PELOSI: We were never told they were being used. MADDOW: Were you told they weren`t being used? PELOSI: Well, they just talked about them, but they – the inference to be drawn from what they told us was these are things that we think could be legal and we have a difference of opinion on that. But they never told us that they were being used because that would be a different story altogether. And we had many disagreements with them all along the way on how they collect information in their country and what they think might be acceptable. They have never gotten any comfort from me on any of these issues, no matter what they want to say publicly. And they know that I cannot speak specifically to the classified briefing of that kind. But I can say flat out they never told us that these enhanced interrogations were being used. “They did not brief us that these enhanced interrogations were taking place. They did not brief us that was – they were talking about an array of interrogations that they might have at their disposal.” Now, Pelosi is admitting that, at a minimum, she knew that these techniques were going to be used. She knew about the torture program and did not act to stop it. Finally, this argument completely abandons any semblance of oversight responsibility. It amounts to arguing “if you can’t believe the Bush White House on international law, who can you believe?” What is particularly striking is that Pelosi is using precisely the same argument that she rejected from Jane Harman on the unlawful surveillance program. Harman insisted that, while she was the critical oversight authority in Congress, she had no knowledge of the law in the area and specifically FISA. She just had to accept the Bush Administration’s insistence that it was legal and did not even have the ability to ask for general information on the law in the area. Now, Pelosi is saying that she just had to accept that a torture program was lawful because the White House said it was. The primary oversight responsibility of these members is to be sure that the Executive Branch is complying with the laws written by Congress. It makes a mockery of the system for Pelosi and Harman to simply take their word for it. The federal law gives Pelosi and Harman the obligation to serve as a check on executive authority, but they believe that this role compels them to accept whatever they are told on the legality of the program. They are simply informed and have not obligations or responsibilities — even when they are given a description of torture. Pelosi’s claim that she could not take any further steps because of the classified nature of the briefing is equally bizarre. Since when can the White House classified a crime — and a war crime to boot? At a minimum, Pelosi could have demanded classified hearings and move to legislatively block the program — while demanding prosecution. She could have demanded a full legal briefing (classified if needed) from democratic staffers on the Intelligence Committee on torture. She could have publicly stated that she believed that the White House was engaged in violations of international law and demand the release of information. There were an estimated 65 members briefed on 40 different occasions. There were many things that she could have done in the face of a war crime. Instead, she and dozens of legislators were ultimately briefed on a program and remains silent — as they campaigned on their commitment to human rights and civil liberties. The Bush Administration knew these members all too well. They fully briefed them on torture on the anniversary of 9-11, knowing that they would not dare to try to stop the program. Then, they held these briefing over their heads over years as the Democrats quietly blocked investigations and protected people like former Attorney General Michael Mukasey from having to answer questions on torture. Democrats cannot demand justice for Bush officials without holding these democratic members also accountable. This is becoming a party of chumps, who will accept any spin to excuse the conduct of their own leaders while denouncing the conduct of GOP leaders. These very same Democratic members, particularly Pelosi, blocked past efforts to investigate the torture allegations and blocked any effort to look into impeachment due to the commission of war crimes. It is now clear (as some of us have been saying for years) that these investigations would have revealed the involvement of Democratic members. On the face of this latest explanation, Democratic voters should be outraged on the lack of personal responsibility claimed by leaders like Pelosi. They are basically claimed that oversight means little more than being briefed with no affirmative duty to challenge such claims as torture being perfectly legal. Any research into waterboarding would have shown that it has long been defined as torture and a crime by the United States. Yet, these members did not want to be in a position of having to question a popular president, particularly on the anniversary of 9-11. They preferred to remain in willful blindness and public popularity. Now that the public is outraged by the torture, there is an effort to re-write the history and excuse the lack of action. For Pelosi’s statement, click here.